The Carolina Hurricanes travel to First Niagara Center to play the Buffalo Sabres on Saturday, March 12, 2016. The opening line for this game has the Hurricanes at -108 and the Sabres at -102. The over/under has been set at 5. Carolina comes into this matchup having played 68 games. They have an overall record of 31-26-11 and on the road they have a record of 14-14-5. Currently they are 6th in the Metropolitan Division. They've scored 168 goals and given up 183 goals for a point differential of -15. The Hurricanes have 11 overtime losses including 3 of them in a shootout. In the past 10 games they have an overall record of 5-4-1. For the season they have an ATS record of 30-37 and an over/under record of 23-25-20. Buffalo shows up with a record of 27-33-9 including 12-18-5 at home this season. They are 7th in the Atlantic Division. They've scored 164 goals and surrendered 188 for a goal differential of -24. The Sabres have 9 losses in OT and 6 of them occurred in a shootout. They have a record of 3-5-2 in their last 10 contests. Their record against the spread is 26-42 while their over/under record sits at 24-29-16. Jordan Staal has accumulated 40 total points this season for the Hurricanes. He has 17 goals this season with 122 shots on goal giving him a shooting percentage of 14%. He has a total of 23 assists on the season and averages 18 minutes played per game. Victor Rask has averaged 17 minutes of ice time per game this year. In that time he has a shooting percentage of 12% by scoring 15 goals on 130 shots. He has 25 assists giving him a total of 40 points on the season. Cam Ward has 20 wins and 15 losses this season in net for the Hurricanes. He has had 1,112 shots against him and has given up 103 goals. He has made 1,009 saves for a save percentage of 91%. 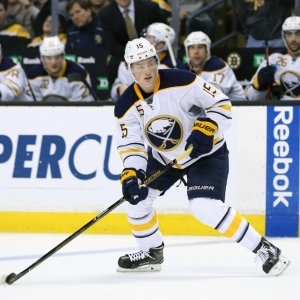 Jack Eichel has accumulated 46 total points this season for the Sabres. He has 20 goals this season with 208 shots on goal giving him a shooting percentage of 10%. He has a total of 26 assists on the season and averages 19 minutes played per game. Sam Reinhart has averaged 17 minutes of ice time per game. In that time he has a shooting percentage of 15% by scoring 19 goals on 129 shots. He has 14 assists giving him a total of 33 points on the season. Chad Johnson has 15 wins and 14 losses this season in net for the Sabres. He has had 975 shots against him and has given up 80 goals. He has made 895 saves for a save percentage of 92%. The Hurricanes have 73 total points this season. They have scored 167 goals while giving up 180 goals. They have had 206 power play opportunities and have scored 36 goals on those chances for a percentage of 17%. The Hurricanes have allowed 168 power play opportunities and given up 29 goals on those chances for a penalty kill percentage of 83%. They average 30 shots per game and as a team are shooting 8.13% for the season to this point. They allow 27 shots to their opposition per contest and have a team save percentage of 90%. The Sabres have a total of 63 points on the season. They have 41 power play goals on 213 opportunities thus far for a percentage of 19%. They have allowed 178 power play opportunities and have given up 33 goals on those chances for a penalty kill percentage of 81%. As a team, the Hurricanes have a total of 162 goals scored while they've given up 182 goals to this point. They average 30 shots per contest and have a team shooting percentage of 7.89%. As a team they give up 31 shots per game and have a save percentage of 92%. Carolina has a Corsi percentage of 53.6% as they've attempted 3,979 shots on net at full strength while they've given up 3,440 shots on net in the same situations. Their Fenwick percentage is at 52.6% as they have 2,938 attempts while they've given up 2,645 shots on the defensive end. The Hurricanes start possessions in the offensive zone 54.7% of the time while their defensive zone percentage is at 45.3% for the season. They have 2,096 face off wins compared to 1,791 losses, meaning their faceoff win percentage is 53.9%. On defense Carolina has 1,297 hits and they've blocked 795 shots from the opposition. Buffalo has attempted 3,641 shots at full strength and they've given up 3,882 attempts, meaning their Corsi percentage is at 48.4% for the season. In terms of Fenwick percentage, they currently are at 48.3% as they have 2,771 shots while they've given up 2,962 attempts on defense. The Sabres have an offensive zone percentage of 49.1% and their defensive zone percentage is 50.9% so far this season. They have a faceoff win percentage of 49.4% as they've compiled 2,044 face off wins this season and they have suffered 2,094 face off losses. On defense Buffalo has blocked 920 shot attempts and they have 1,620 hits as a unit.